Scientists at Harvard Medical School say they have ended a 40-year-quest for the elusive identity of the sensor protein responsible for hearing and balance.The results of their research, reported Aug. 22 in Neuron, reveal that TMC1, a protein discovered in 2002, forms a sound- and motion-activated pore that allows the conversion of sound and head movement into nerve signals that travel to the brainÑa signaling cascade that enables hearing and balance. Scientists have long known that when the delicate cells in our inner ear detect sound and movement, they convert them into signals. Where and how this conversion occurs has been the subject of intense scientific debate. No more, the authors say. The researchers found that keeping the head still but shifting the eyes to one side or the other sparks vibrations in the eardrums, even in the absence of any sounds. 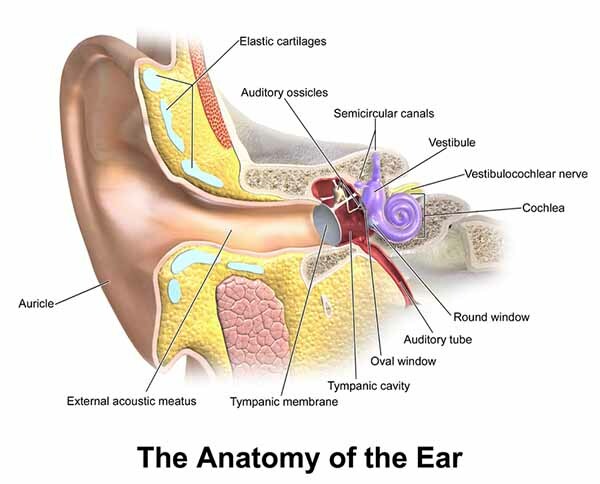 Surprisingly, these eardrum vibrations start slightly before the eyes move, indicating that motion in the ears and the eyes are controlled by the same motor commands deep within the brain. The findings, which were replicated in both humans and rhesus monkeys, provide new insight into how the brain coordinates what we see and what we hear. It may also lead to new understanding of hearing disorders, such as difficulty following a conversation in a crowded room. A new study solves a critical piece of the puzzle of human deafness by identifying the first group of long non-coding RNAs (lncRNAs) in the auditory system. In many ways, Caiden Moran is an average five-year-old boy. Running around his front yard, climbing trees and playing with his brother, the only difference you might notice is the small device on the side of his head. A new study by a team of researchers in Germany has resulted in findings that suggest the human ear is more impacted by low frequency sounds than has been previously thought. 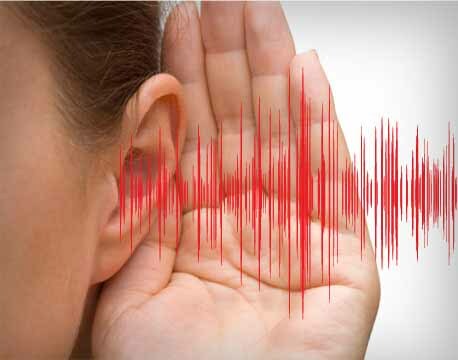 Humans can hear sounds in the range 20 and 20,000 Hz - sounds above and below that range enter the ear but cannot be heard. In recent years some people, inside and outside the science community, have begun to wonder if sounds that fall below that range might be having an impact on us that we don't know about. Some have suggested, for example, that low noises emitted by wind-farms cause a wide variety of problems from sleeplessness to headaches. Others have suggested jet engines, office equipment or air-conditioning units might be causing problems. When we want to listen carefully to someone, the first thing we do is stop talking. The second thing we do is stop moving altogether. This strategy helps us hear better by preventing unwanted sounds generated by our own movements. This interplay between movement and hearing also has a counterpart deep in the brain. Indeed, indirect evidence has long suggested that the brain's motor cortex, which controls movement, somehow influences the auditory cortex, which gives rise to our conscious perception of sound. The ear is an important organ that allows us to perceive the world around us. However, very few of us are aware that not only the ear cup but also our skull bone can receive and conduct sounds Tatjana Tchumatchenko from the Max Planck Institute for Brain Research in Frankfurt and Tobias Reichenbach from Imperial College London have now developed a new model explaining how the vibrations of the surrounding bone and the basilar membrane are coupled These new results can be important for the development of new headphones and hearing devices. Cochlear implants have restored hearing to many deaf people, but they havenÕt advanced much since they were unveiled in the 1970s. That may be set to change with an exciting new advance, not in the technology of the device itself, but rather in using gene therapy to increase the deviceÕs effectiveness. Today researchers announced that theyÕve been able to restore tonal hearing in guinea pigs with the new method of gene delivery. The protein helps turn sound into electrical signals. The research is of more than just biochemical interest; it may also open a new avenue for possibly giving the sense of hearing to some of those who are born without it. A 300-year-old, leather-bound instruction manual contains some of the earliest examples of attempts to teach the deaf to communicate. The manual belonged to Alexander Popham, a deaf teenager from a noble English family who was taught to speak in the 1660s. The leather-bound notebook was discovered in 2008 at a stately English manor called Littlecote House. The finding suggests that one of the boy's tutors, John Wallis, was a few hundred years ahead of his time in understanding that deaf people needed their own language to communicate, said linguist David Cram of the University of Oxford. Our ears contain an elaborate system of chambers that convert mechanical energy into an electrochemical signal, much like a battery. Without those signals, we'd be unable to balance or hear. Now a new wireless microdevice can actually run on that scant energy. The technique could provide an inexhaustible power source for localized therapies and even hearing aids. Rising from the top surface of each of the specialized receptor cells in our inner ears is a bundle of sensory cilia that responds to the movement of sound. As sensitive as they are fragile, these cilia can move to wisps of sound no larger than a molecule but can shear at sounds that are larger than life. Selective hearing - the ability to filter out unwanted noise and conversation - really does exist, according to research that scientists hope could help combat deafness. We not only hear with our ears, but also through our skin, according to a new study. The finding, based on experiments in which participants listened to certain syllables while puffs of air hit their skin, suggests our brains take in and integrate information from various senses to build a picture of our surroundings. Along with other recent work, the research flips the traditional view of how we perceive the world on its head. We hear with our ears, right? Yes, but scientists have known for years that we also hear with our eyes. In a landmark study published in 1976, researchers found that people integrated both auditory cues and visual ones, like mouth and face movements, when they heard speech. A team led by scientists from The Scripps Research Institute has discovered a genetic cause of progressive hearing loss. The findings will help scientists better understand the nature of age-related decline in hearing and may lead to new therapies to prevent or treat the condition. We humans prefer to be addressed in our right ear and are more likely to perform a task when we receive the request in our right ear rather than our left. In a series of three studies, looking at ear preference in communication between humans, Dr. Luca Tommasi and Daniele Marzoli from the University "Gabriele d'Annunzio" in Chieti, Italy, show that a natural side bias, depending on hemispheric asymmetry in the brain, manifests itself in everyday human behavior. Scientists thought they had a good model to explain how the inner ear translates vibrations in the air into sounds heard by the brain. Now, based on new research from the Stanford University School of Medicine, it looks like parts of the model are wrong. Scientists exploring the physics of hearing have found an underlying molecular cause for one form of deafness, and a conceptual connection between deafness and the organization of liquid crystals, which are used in flat-panel displays.